Now, FIRIS has no idea why a NSW public school principal would think that this was an appropriate thing to do. In fact, FIRIS thinks that a reasonable member of the NSW public would be justified in perceiving the tweet as making a mockery of a parent’s frustration regarding the need for them to opt their child out of SRE. However, the tweet exposes larger problems regarding SRE than simply a principal’s poor judgement call whether to-tweet or not-to-tweet. Firstly, it reveals a fundamental lack of understanding of the NSW Department of Education’s policies and procedures regarding SRE. 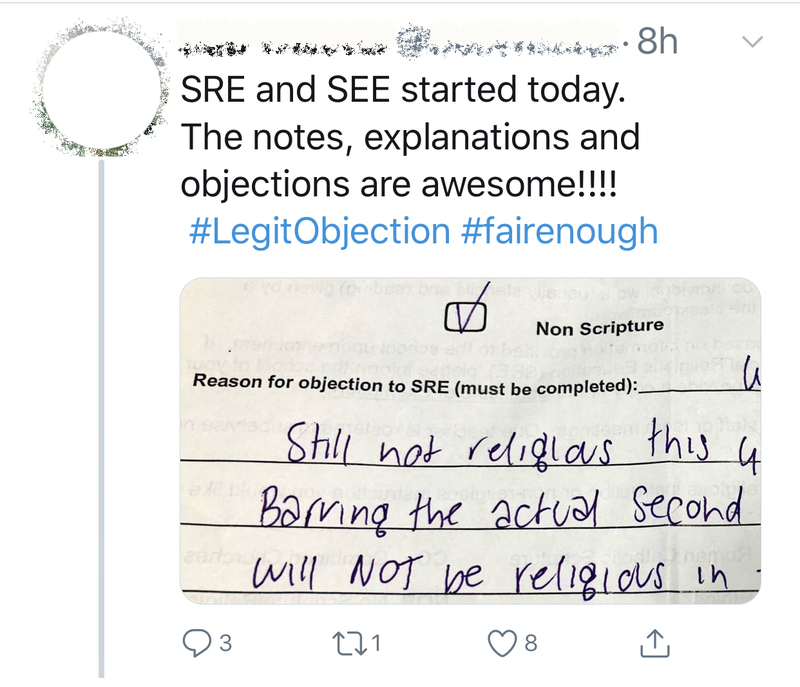 When asked by someone why a ‘reason for objection to SRE’ had to be provided, the principal responded by saying that a reason was required by law and by the Department. No child at a government school is to be required to receive any general religious education or special religious education if the parent of the child objects to the child’s receiving that education. A parent/caregiver may at any time notify the school in writing that they do not wish their child to attend SRE or to change their SRE nomination. no one can be compelled to reveal his thoughts or adherence to a religion or belief. Needless to say, the tweet was quickly deleted. However, FIRIS believes that the principal’s lack of knowledge and understanding of the Procedures has created this situation requiring the parent to respond in this way. The Procedures have stated clearly since 2013 that once a parent or caregiver chooses or objects to SRE when enrolling their child in a school, their child continues in the ‘same arrangement as the previous year’ until the parent or caregiver requests a change. 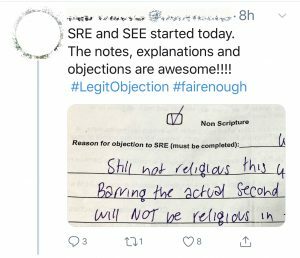 The parent should not have to be objecting to SRE for a second time. SRE apologists might try to dismiss the above by stating that the principal’s lack of knowledge and understanding is an isolated case. However, before we respond to such potential claims we need to look at what makes this instance even more concerning. The principal in question is a Vice President on the State Executive of the NSW Primary Principals’ Association (PPA), an organisation which has a representative on the Department’s SRE Consultative Committee. This Committee is meant to provide advice to the Department about SRE and SEE in NSW Government schools. However, the lack of knowledge and understanding demonstrated above gives rise to questions regarding the ability of the PPA to ensure the rights of non-religious parents and caregivers and their children are protected and respected. An audit of school websites currently being conducted by FIRIS is revealing that a lack of knowledge and understanding of the Department’s Procedures is widespread. One concerning discovery has been the failure of principals to check that religious groups are an approved SRE provider before allowing them to enter NSW public schools. FIRIS has already had one confirmed case reported on in the Sunday Telegraph and we are awaiting confirmation regarding another. A far more widespread problem is the unbelievably low rates of compliance with the simple requirement to provide links to SRE curriculum scope and sequence documents on school websites. Schools have known since December 2017 that this was required by the beginning of the 2019 school year. However, of the 486 primary school websites audited so far by FIRIS , only 8 websites (1.64%) have contained links to other information. Furthermore, of the 29 links included in these 8 website pages, only 17 were clear links to curriculum scope and sequence information. Even more concerning, is the general confusion and misrepresentation of SRE evident on school websites. This confusion casts serious doubts that principals have implemented the new 2019 enrolment processes correctly. These doubts are being confirmed by the SRE and SEE Participation Letters coming into FIRIS’ possession. It seems that 2019 will be another year in which students are exposed to the risks associated with SRE without informed and express consent from their parents, requiring FIRIS to take these issues beyond the conflict-of-vested-interests Minister for Education.